We finally got our new oven delivered late this week, and it’s been great to finally have a fully functioning kitchen up and running again. Our old 1980-ish model oven worked fine up until the igniter died, but because it was such an eyesore in the kitchen, a little part of me went yay when it was hauled away and replaced with a pretty and new stainless steel oven. This french toast was one of the first things to come out of it, and it tasted absolutely amazing: it was soft and cakey in the middle, and that texture was perfectly sealed in by a glazey sear on the outside. Thanks to The Vegg, this featured a custard-like flavor and an airy quality I haven’t been able to replicate before in a french toast. I’ve never had “real” challah before, but decided to use it to make this french toast due to its described cake-like quality. Challah recipes traditionally include eggs, but I was able to easily swap that out with equal parts of The Vegg and Ener-G. Our entire house smelled like a bakery while this was in the oven last night, and managed to linger around through to the next morning. This bread was so good straight out of the oven, I could have eaten an entire loaf of it in one sitting. It was rich, puffy, buttery, cakey, slightly sweet and just perfect on its own. I followed this recipe, but substituted a mixture of 1 tsp of The Vegg with 1 tsp of Ener-G, mixed with 1/4 cup water for the egg. Instead of glazing the bread as instructed, I just sprayed it with some cooking spray during the last 10 minutes of the baking time. Place The Vegg, Ener-G and water in a Kitchen Aid mixer. Mix on high, then scrape down the sides of the bowl with a spatula and mix again. Add in the rest of the ingredients and whisk on medium high for 2-3 minutes. Pour half of the mixture into a large glass pyrex dish that’s been sprayed with a little cooking spray. Place the slices of bread into it, swirling it around to ensure all pieces are well coated. Pour a bit more of the mixture over the top. You want the bread to be moist, but not swimming in the mixture. Place it into the oven, uncovered, for about 15 minutes. Remove the dish from the oven and flip all of the pieces over. If any of them look a little dry, add a bit more of the mixture over the top. Place back into the oven to bake for about 15 minutes more. If you want to make the coconut cream sauce while you wait for the french toast to finish baking, rinse out the Kitchen Aid bowl and mixture, then place all of the ingredients into it, and whisk on medium high for three minutes. Then, place it in the freezer to slightly chill. To sear your french toast, preheat a skillet over medium-high heat for about two minutes, Spray with a little cooking spray, then place the french toast pieces into it for about two minutes per side, or until a nice sear forms. Top with the chilled coconut cream, or powdered sugar and syrup. that is some gorgeous french toast! it really looks like something you can sink your teeth into. i've never had challah either, but it was sold ata bakery that i used to work at. it always looked so airy and soft, and i can imagine it would make a perfect bread for french toast. Thanks Caitlin! I recall seeing lots of gf versions of challah while looking for this recipe as well! 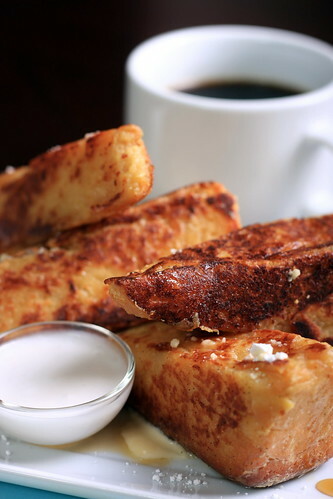 must make .. must make this french toast. sounds so delicious. Thanks Richa — I love The Vegg! Good gods, Woman, this is vegan? I’d hang that photo on my wall! It’s gorgeous!